This is the first part of a two-part examination of the National Wild and Scenic Rivers System. In Part 1, we examine the history of the Wild and Scenic Rivers Act of 1968, the size of the system and how it works, and the outsized role Oregon has played in the development of the system. In Part 2, we will examine the possibilities of protecting additional wild and scenic rivers with a focus on Oregon, and closing a notorious mining loophole in the original act. Figure 1. Koosah Falls on the McKenzie River. The segment between Clear Lake and Carmen Reservoir is included in both the National Wild and Scenic Rivers System and the Oregon Scenic Waterways System.Source: George Wuerthner (first appeared in Oregon Wild: Endangered Forest Wilderness). There are times when Congress acts in a visionary manner. (Is it less so today, or is it just me?) Such was the case in 1968 when it enacted into law the Wild and Scenic Rivers Act (WSRA). It is hereby declared to be the policy of the United States that certain selected rivers of the Nation which, with their immediate environments, possess outstandingly remarkable scenic, recreational, geologic, fish and wildlife, historic, cultural, or other similar values, shall be preserved in free-flowing condition, and that they and their immediate environments shall be protected for the benefit and enjoyment of present and future generations. The Congress declares that the established national policy of dam and other construction at appropriate sections of the rivers of the United States needs to be complemented by a policy that would preserve other selected rivers or sections thereof in their free-flowing condition to protect the water quality of such rivers and to fulfill other vital national conservation purposes. WSRA started out modestly with just eight rivers initially included in the National Wild and Scenic Rivers System (NWSRS). Among those first eight rivers protected “for the benefit and enjoyment of present and future generations” was an 84.5-mile segment of Oregon’s Rogue River, from the mouth of the Applegate River in Josephine County to the Lobster Creek Bridge in Curry County. The Rogue Wild and Scenic River (WSR) is jointly administered by the US Forest Service and the Bureau of Land Management. The original WSRA also mandated that certain congressionally specified stream segments be studied by federal agencies, which would then recommend to Congress whether those segments should be included in the NWSRS. One of those original “study rivers” was the entirety of the Illinois River in Oregon. That meant from where the East and West Forks of the Illinois River enter Oregon in Josephine County to the confluence with the Rogue River in Curry County. In 1984, Congress established the Illinois WSR but jettisoned the forks and the upper main stem by starting the protected segment at the Siskiyou National Forest boundary near Eight Dollar Mountain. The proposed Buzzards Roost Dam would never be built. To qualify for inclusion in the NWSRS, a stream must be free-flowing and have at least one outstandingly remarkable value. · At least one outstandingly remarkable value. A stream segment is included in the NWSRS because it has outstandingly remarkable “scenic, recreational, geologic, fish and wildlife, historic, cultural, or other similar values” (most have more than one). The language “other similar values” has been interpreted by Congress when making additions to the NWSRS, or by agencies administering WSRs, to include a myriad of other values specific to a particular WSR. Though WSRA mentions the term “outstandingly remarkable value” just once, such outstandingly remarkable values (ORVs) determine the amount and kinds of protection a WSR will receive. No administering agency has produced a definitive list of ORVs. At one time, the Bureau of Land Management defined “other similar values” in manual direction to its employees as “including, but not limited to, hydrologic, ecologic/biologic diversity, paleontologic, botanic, and scientific study opportunities.” Though I’ve not done an exhaustive analysis, I’ve found eighty-one distinct ORVs listed in management plans for various WSRs in Oregon, from “active glacier” to “wildlife habitat and populations” and from particular kinds of statutory ORVs to particular places of interest. A stream segment can become a wild and scenic river via two routes. One route is for a governor of a state to request, and for the secretary of the interior to approve, that an already state-protected river (or stream or lake) be included in the NWSRS. No act of Congress is necessary. In Oregon, segments of the Klamath (11 miles) and Wallowa (10 miles) are in the NWSRS because Governor Barbara Roberts so asked and Interior Secretary Bruce Babbitt so approved in 1994 and 1996 respectively. · Congressionally mandated study. The original WSRA included a small list of rivers for instant WSR status and a longer list of rivers for a federal land management agency to study to determine suitability for designation. The agency, through the president, was to make recommendations to Congress. This is how portions of the Illinois, John Day, North Umpqua, and Owyhee found their way into the NWSRS. In 1998, Congress also ordered formal studies for portions of the Blue, Chewaucan, North Fork Malheur, South Fork McKenzie, and Wallowa Rivers, and for Steamboat Creek. Alas, most of the recommendations by the studying agency were negative and Congress has yet to act on the positive recommendations. · Agency study. In addition to congressionally mandated study streams, WSRA requires all federal agencies, when “planning for the use and development of water and related land resources,” to “consider and discuss” potential WSRs. This means that the Forest Service and the Bureau of Land Management are required, when revising land and resource management plans, to consider and discuss wild and scenic rivers. The results have been generally disappointing. For one thing, the agencies fail to evaluate many streams within their jurisdictions that are free-flowing and have at least one outstandingly remarkable value. For another, most of those streams it does evaluate (found “eligible” for WSR designation) are found by the agency to not be “suitable” for WSR designation. In most cases, nonsuitability boils down to the fact that the agency doesn’t want its management discretion limited by WSR status. Such is the general nature of bureaucrats. · Citizen nomination. The only thing harder than getting an act of Congress is getting two acts of Congress, one to study and one to designate a river segment as part of the WSRS. Since most agency studies—especially those by the Forest Service and the Bureau of Land Management—are negative (for the reasons stated above), river lovers are increasingly making their cases directly to a state’s congressional delegation to just designate a wild and scenic river, foregoing the time, expense, and disappointment of the intervening study. The formal congressional study path is still sometimes used by Congress when it lacks the political will to either say yes or no to a wild and scenic river, but the days when this path was the dominant paradigm ended when an Oregon senator broke with it. In 1988, Congress enacted into law the Oregon Omnibus Wild and Scenic Rivers Act. Breaking with the increasingly unworkable enact-a-statute-to-study-then-enact-a-statute-to-designate path, Senator Mark Hatfield started with a list of Oregon streams found “eligible” by the Forest Service and the BLM for WSR status, dropped some and added a few others, and then got the package enacted into law. The result was forty new units of the NWSRS totaling 1,441 miles. Today, despite the best efforts of the late great (in other ways) Hatfield, Elk Creek again flows free after a half-built dam was blown up; logging of Oregon’s remaining ancient forests hasn’t quite ended, but almost; and that stretch of the Klamath is a wild and scenic river (having made it by going around Congress through the action of an Oregon governor and a secretary of the interior). · Wild river areas. Those rivers or sections of rivers that are free of impoundments and generally inaccessible except by trail, with watersheds or shorelines essentially primitive and waters unpolluted. These represent vestiges of primitive America. · Scenic river areas. Those rivers or sections of rivers that are free of impoundments, with shorelines or watersheds still largely primitive and shorelines largely undeveloped but accessible in places by roads. · Recreational river areas. Those rivers or sections of rivers that are readily accessible by road or railroad, that may have some development along their shorelines, and that may have undergone some impoundment or diversion in the past. In brief, wild river areas have no roads, scenic river areas are crossed by an occasional road, and recreational river areas are paralleled by a road or roads. From a protection standpoint, only on federal lands within wild segments is new mining prevented. The classification does not allow an administering agency to deviate from its duty to “protect and enhance” the outstandingly remarkable values for which a stream is designated. There is no one agency overseeing the NWSRS. WSRs in the NWSRS are generally managed by one of four federal agencies: the Bureau of Land Management, the Fish and Wildlife Service, the National Park Service (all within the Department of the Interior), or the Forest Service (within the Department of Agriculture). The four federal agencies have established the Interagency Wild and Scenic Rivers Coordinating Council. In one case, the Army Corps of Engineers administers 4.6 miles of the Cossatot River in Arkansas, with the rest administered by the Forest Service. Those that became WSRs through the state governor–interior secretary path are generally managed by that state. Nine are co-managed by the National Park Service and local government, with two of those also involving state government. Each WSR has a management plan prepared by the administering agency. The management plan documents the outstandingly remarkable values and determines the classification(s) of the designated WSR, if Congress hasn’t already done so in the enabling legislation (almost always the case these days). You may be able to find the management plan for your favorite WSR on the National Wild and Scenic Rivers System website, or you may not. Many management plans were done pre-Internet and are not usually updated. The administering agency determines the lateral boundaries of the WSR. The WSRA default setting is that the management corridor consists of “not more than 320 acres” of land above high water per designated stream mile. This pencils out to an average corridor width of one-quarter mile on each side of the stream. To better protect the various outstandingly remarkable values, an administering agency can fatten up the corridor is some places and thin it in others, as long as the maximum acreage limit is not exceeded. In some cases, Congress has boosted the acreage limit to 640 acres or an average of one-half mile from each stream bank. In Oregon, the fat boundary mandate applies to the Elkhorn Creek and Fifteenmile Creek WSRs. While a federal agency (and sometimes a state or local agency) administers a WSR, it doesn’t necessarily follow that it owns all the land within the WSR. Federal agencies can acquire lands and interest in lands (easements) from willing sellers, which is the usual path to increase public lands within a wild and scenic management corridor. WSRA also grants the administering federal agencies condemnation authority to obtain (and pay just compensation for) lands with WSRs. Condemnation can be used to obtain easements to protect the scenery or to provide public access. However, this authority is limited to cases where government agencies (federal, state, and/or local) own less than half of the land in the management corridor. In Oregon, every WSR is within lands that are more federally owned than not, so it’s not an issue. · No water projects (dams, diversions, and such). This total ban applies not only to projects that would “invade” within a wild and scenic river, but also any such project that would “unreasonably diminish” the outstandingly remarkable values for which the river was protected. · No new mining claims on federal lands within wild-classified streams. For those segments classified as “wild” and only on federal land, no new mining claims can be filed. Existing claims, if they are actually valid existing rights (a high bar), can be mined. Protection against other bad things such as logging, roading, grazing, and over-recreation is afforded not by a flat ban but by a congressionally directed affirmative duty by the managing agency to administer the wild and scenic river “in such manner as to protect and enhance the values which caused it to be included in said system.” Thus, what is generally allowed or not allowed in a WSR is specifically tied to whether or not it protects and enhances the outstandingly remarkable values for which the WSR was included in the NWSRS. Map 1. 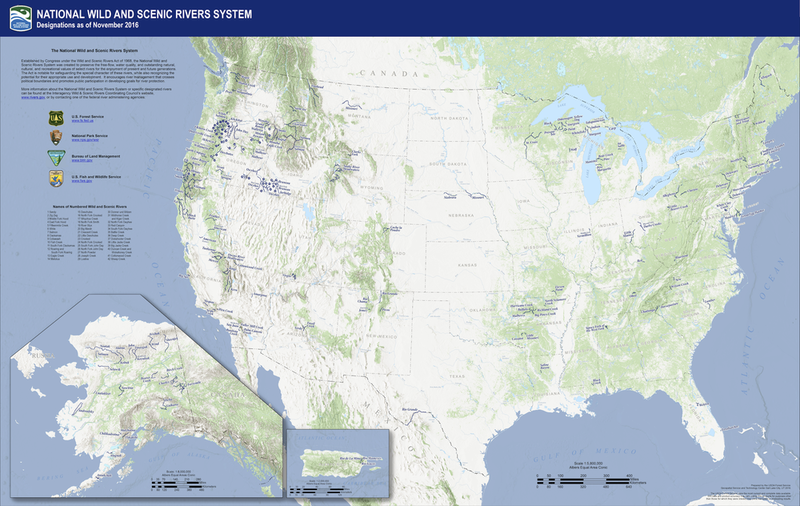 The National Wild and Scenic Rivers System. (You can download a more larger and therefore readable copy by clicking on the source link.) Source: Forest Service. Sometimes the politics are such that full WSR status for a river segment is not politically achievable. In some such cases, Congress has nonetheless extended the federal prohibition against dams and other water projects to this river segment. While there is no mandate to “protect and enhance,” at least there won’t be a damn dam. As of the latest addition to the NWSRS in 2014, there are 208 units totaling 12,733.5 miles—6,206.9 wild, 2,751.8 scenic, and 3,774.8 recreational (Map 1). One of the most recently added was the River Styx in Oregon Caves National Monument. Though only 0.4 miles long, it is the nation’s first subterranean wild and scenic river. Aboveground, both upstream and downstream, the stream is known as Cave Creek. Oregon has made an outsized contribution to the system and is also enjoying an outsized benefit.Fifty-nine units of the NWSRS are in Oregon (Map 2), totaling 1908.0 miles (one, the Snake, is shared with Idaho; three others, the North Fork Smith, main stem Owyhee, and North Fork Owyhee, continue into other states). These comprise 28 percent by number and 15 percent by mileage of the entire system. They also comprise less than 1 percent of Oregon streams, by mileage. The area of water and land protected in these Oregon units of the NWSRS is 595,456 acres. 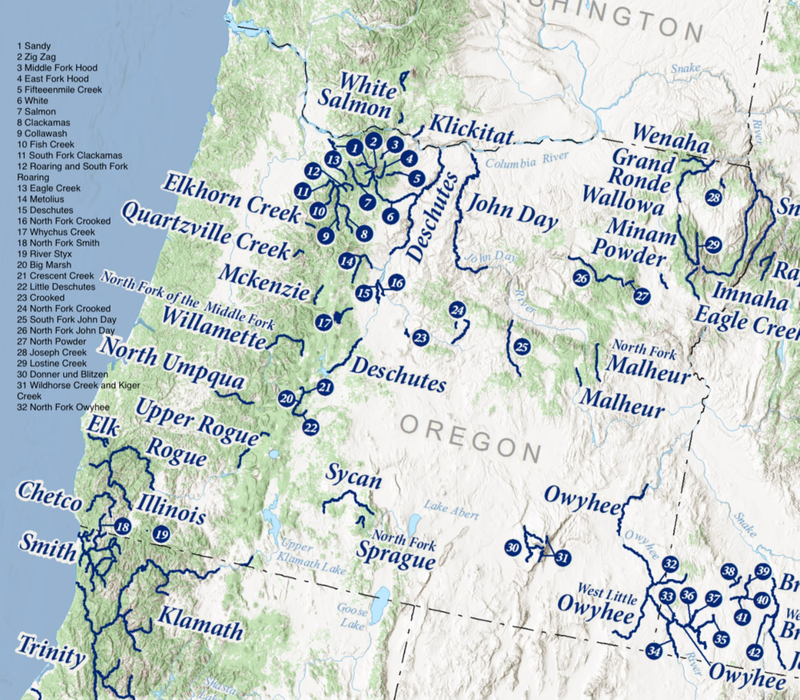 A detailed listing including name, mileages, classifications, date established, upper and lower termini, and ecoregion can be found in “National Wild and Scenic Rivers and State Scenic Waterways in Oregon” (Larch Occasional Paper #13.1, 2015). Map 2. Oregon streams in the National Wild and Scenic Rivers System. (For a larger and more readable version of this clip of a larger map, click here.) Source: Forest Service.